A 136 channel hybrid lighting control device designed for DJs, clubs, and small touring applications, the American DJ DMX Operator Pro Lighting Controller puts the control in your hands! 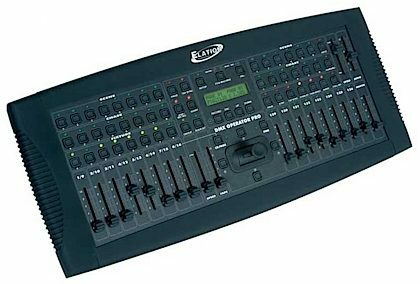 The DMX Operator Pro allows operators to easily manipulate conventional and moving lights via simple to use buttons and faders, and puts programming, playback and live manipulation of Scenes and Chases at your fingertips. The DMX Operator Pro can control up to 8 moving lights, each consisting up to 16 channels for a maximum of 128 channels. Up to 96 programmable Scenes and 8 programmable Chases can be recorded for the moving light section, and up to 96 programmable Scenes and 6 programmable Chases can be recorded for the conventional PAR can section. The DMX Operator Pro features 14 quick access scene buttons, 8 for moving lights and 6 for PAR cans, 8 quick access Chase buttons for moving lights, and 6 Chase buttons for PAR cans. An assignable joystick ideal for pan/tilt control of scanners and moving heads, master fader used to control the overall intensity for all 8 PAR can channels, and a separate section of 8 independent faders are included so the lighting operator can easily control PAR cans on the fly. Other features include a Tap Sync button for manual Chase override, Step/Mix/Sequence button for Chase playback, Audio button for music trigger (via internal microphone or line level input), Group button to control more than 1 fixture at a time and four speed and fade faders for manual override of Chases. "Best Easiest DMX Controler Ever"
Overall: This is it folks if you do not have a clue on DMX please do several of the you tube videos to learn and understand what DMX is and how to apply it. If you don't know how to calculate the dip switch codes there's several free phone apps that will do it for you.